Silent-era idols John Stuart and Mabel Poulton share a bill with Hollywood star Elissa Landi in this early British crime thriller, written by Frank Launder and Miles Malleson. 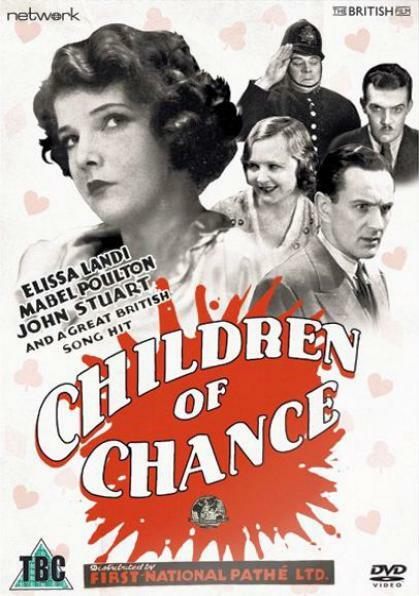 Shot at Elstree Studios in the summer of 1930 as a bilingual production, only the English language version of Children of Chance remains. Though the quality of both sound and vision is variable in places, this is a brand-new transfer from the longest existing film elements, in its as-exhibited theatrical aspect ratio. A casual date at a high class hotel leads Binnie, an aspiring showgirl, to be mistaken for model and actress Lia de Marita - landing Binnie an audition for the producer of a new musical stage show. Marvelling at her good fortune, what Binnie doesn’t know is that Lia is also the wife of a notorious jewel thief and that she’s already fled the country in possession of a valuable, ill-gotten necklace! Featuring: Children of Chance (1949).